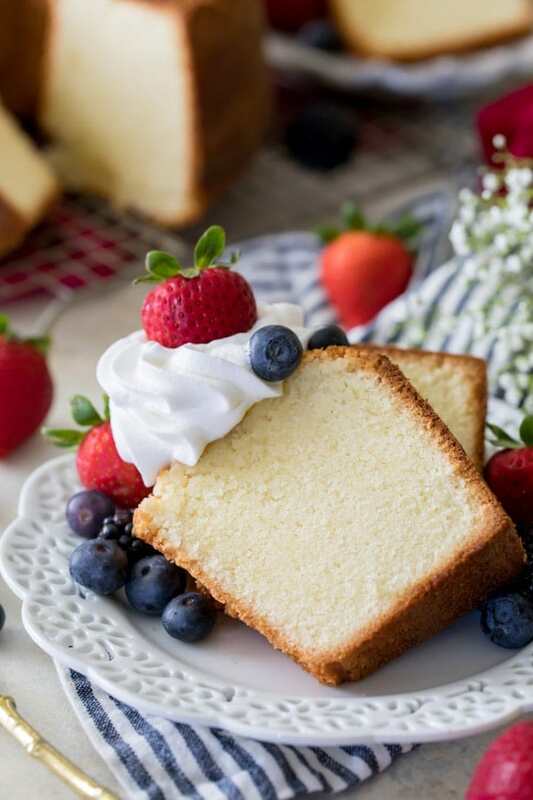 You are here: Home / Desserts / Cake / The Best Pound Cake Recipe (with Video)! 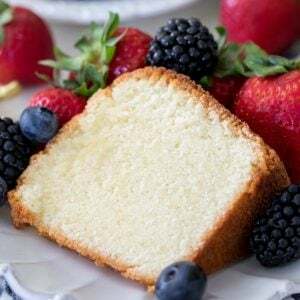 The Best Pound Cake Recipe (with Video)! 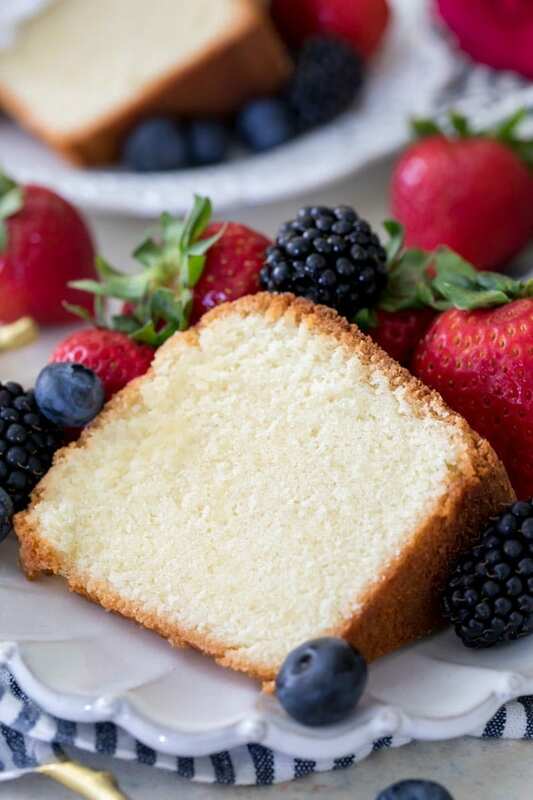 A simple classic, this really is the best pound cake recipe! While pound cake has traditionally been made with a pound each of butter, sugar, eggs, and flour, I’ve made some small adjustments for the best flavor (hello, vanilla extract!). My recipe has a soft, buttery crumb that’s perfectly dense without being at all dry or crumbly and I think you’re really going to like it! Recipe includes a how-to video. I don’t know where pound cake rates in terms of your favorite cake recipes, but I’ll admit it’s never been a top contender for me. Humble and frosting-less, sure I would eat a slice or two but nobody in my house ever really got excited about pound cake. Growing up, my mom would always make it as a way to use up her leftover egg yolks after making an angel food cake, AKA my favorite cake, so pound cake has always just been to me what Jon Snow was to Catelyn Stark (the book-version of Cat, I haven’t watched the series but I hear she’s nicer there). Easily overlooked for what I believed was something much better. Well things have changed (and Jon Snow is my favorite character, anyway), and I hope you won’t make the same mistake that I did of overlooking one of the most classic, best-tasting cakes to ever grace my kitchen. So, what is so great about this pound cake recipe, anyway? For starters, it has a tight, dense crumb that’s in stark contrast to the “light and fluffy” cakes that I usually share. This is a heavy cake with a heavy, velvety batter, but there’s nothing dry or crumbly about it. Instead, each bite of this cake is moist and buttery and just melts in your mouth. Simple as sunrise with just 6 ingredients, flavored with pure vanilla extract and carefully prepared (it’s not difficult to make, but there is some technique involved), this cake is a dream to devour. 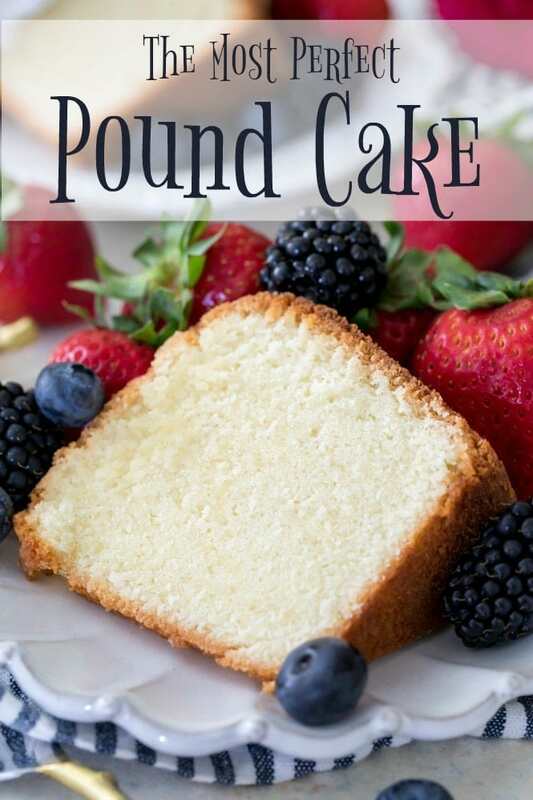 Let’s go over some of the basics for making this pound cake recipe. What are the ingredients for pound cake? Traditionally, pound cake is made with butter, sugar, eggs, and flour. After many, many taste testing sessions I decided to add vanilla extract and salt, as well. 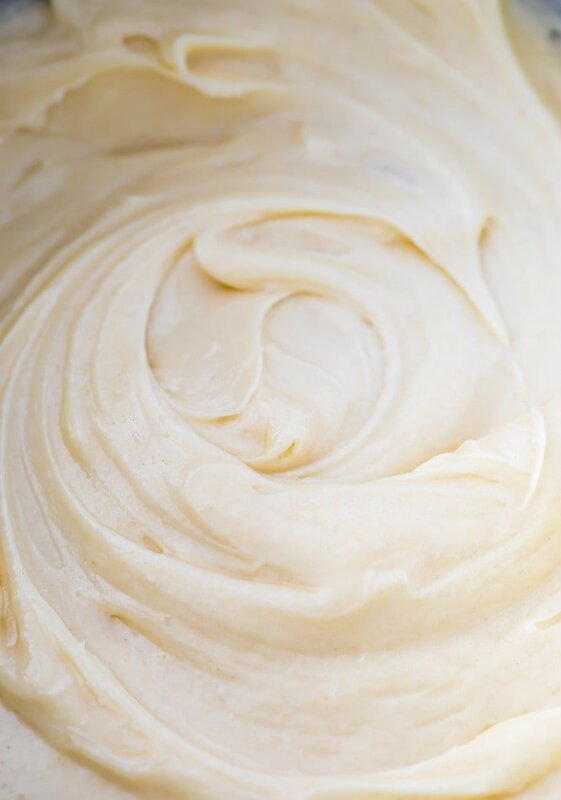 If you’ve read my post on salted vs unsalted butter, you already know that I generally like to use unsalted butter in my recipes and then add salt in order to have the most control over the flavor of my cakes, and a splash of vanilla in the batter was pretty much a no brainer for the best flavor. Can I make this recipe using cake flour? I know somebody is going to ask me this so I wanted to address this here. Generally I engineer all of my recipes to be made with all-purpose flour and this recipe is no different. However, for those of you who like using cake flour, the answer is yes, you can do a straight 1:1 substitute for cake flour. This pound cake will turn out just as well; slightly softer, a smidge less dense, but still delicious. I played around with different amounts and different substitutions and finally decided that a 1:1 substitution worked best if you absolutely have your heart set on using cake flour. Personally, I just stick to all-purpose. How can I tell if my pound cake is finished baking? Because of its thick batter and the sheer volume of batter, it’s going to take over an hour for your pound cake to finish baking, probably an hour and ten to an hour and fifteen minutes. However, for this pound cake to turn out moist and not dry, the most important thing when baking your pound cake is to make sure that you do NOT over-bake it. I recommend first making sure your oven is not running hot (I keep two oven thermometers in my oven at all times just to make sure my oven display is telling me the truth) and then checking your cake earlier rather than later. I check my cake at one hour and then return it to the oven in about 5-minute increments until it’s finished baking. To test if it’s finished, the best method is to use a long wooden skewer (like the kind used for shish-kebabs) as this batter is so thick that a toothpick just won’t cut it. Insert the skewer into your pound cake and check it for moist crumbs. If you have wet batter on your skewer, your cake needs to bake longer, but if there are a few moist crumbs then it’s time to pull that cake out of the oven! The pound cake is going to continue to bake while it cools, so if you pull out a completely clean skewer from your cake, it’s already at risk of being over-baked and dry, so you want to retrieve your cake from the oven before it hits that point. Since I mentioned my mom’s recipe earlier, I think that I should mention that this actually isn’t her pound cake recipe, but it will use up egg yolks just as well (with over a dozen hens, using up eggs was always a challenge in our household). Hers strays a bit further from the traditional guidelines that I was trying to adhere to and is technically a “German Gold Pound Cake Recipe” and I’ll probably share that one in time (it’s truly delicious, I overlooked it in the past purely out of misguided prejudice). If you enjoy watching my cooking videos, please consider subscribing to my YouTube channel! This is truly the BEST pound cake recipe, soft and dense with a wonderful flavor and made completely from scratch! I recommend having a wooden skewer on hand to be able to check this recipe to see that it's finished baking. Preheat your oven to 350F (175C) and generously grease and flour a 10" tube pan. Shake out excess flour and set aside. Place your butter in a large bowl (this recipe makes a lot of batter! I recommend using a stand mixer if you have one) and use an electric mixer to beat the butter until it is creamy and smooth. In a separate, medium-sized bowl, combine your eggs, egg yolks, vanilla extract, and salt. With mixer on low speed, slowly pour egg mixture into your batter, allowing it to gradually become incorporated (don't pour all the egg mixture in at once, if you can't manage a steady stream then add the egg mixture in about 6 parts, allowing each part to become well incorporated before adding more). Once all of the egg mixture is incorporated, pause to scrape down the sides and bottom of the bowl, then increase speed to medium-high and beat for another 1-2 minutes. If you want to use cake flour, substitute 3 1/2 cups or 448g of cake flour. 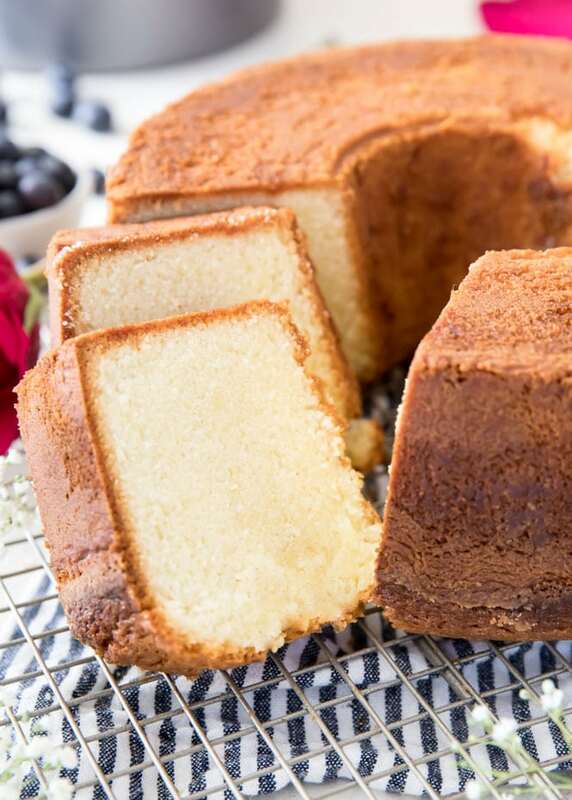 I enjoyed reading the comments on this pound cake, sounds delicious my I bake them all the time, but never baked on 350 degrees, so would it work well on 325 degrees? Hi Theresa, it would need to bake for a longer amount of time but I think it could work at that temperature. This cake works best at 350 degrees though. (the size you see in the bakery with my Mom’s cast iron molds. Any idea if this recipe is the right amount of cake (and baking time) Mom has alzheimers so she can’t help with these details. So long as the batter fits with additional room then it can be used in any pan. However since I’m not sure of the exact dimensions of the pan I can’t say how long it will need to bake, but I am sure it will be different than the time indicated here. I made this recipe following the directions. Making this pound cake was so easyand delicious. The only change was 1/2 cup of coconut oil. Pulse the butter. Could this recipe be used with a cast iron lamb pan? Would I adjust the time? Can this be made with a bundt pan instead of a tube pan? I have made this twice using two diffrent pans. The second was a better pan but the outside still seemed to get a little to dark. I think I’ll try cooking it at 325° for a little longer. All that being said this cake is AMAZING!!! I absolutely love it! So does my family. Sweet and moist! Keeping this recipe for sure! Thanks for sharing! This recipe was disappointing. I wasted a ton of ingredients. I was counting on a dense cake, it was so airy and way too fluffy. I even made a point to tap and cut out air with knife before pouring out batter, used a paddle too not an air whisk. Bubbles like mad. Eeek!!! Hi Carrie, did you use self rising flour by chance? Also did you use 12 eggs or just the 6 eggs and 6 additional yolks? There’s no way this cake should come out fluffy or airy. I had a lot of eggs I needed to use up and found this recipe. This cake turned out perfect. Followed exact directions. Used a high quality butter & fresh flour. Baked 1 hour and 15 minutes. Very moist. Tastes very good. Will definitely be making this again! I am so glad you enjoyed the cake Amy! It’s my favorite way to use up a bunch of eggs. I was very disappointed in this recipe. It came out just like regular cake, very fluffy, not dense. Also, the cake has a distinct flavor of its own, not like pound cake. It’s basically just regular vanilla cake. Not impressed. Hi Lorenna, did you use self-rising flour by chance? I used King Arthur Unbleached All Purpose flour. 🤷‍♀️ Im pregnant and am craving pound cake. I made this with a really hurt neck (because I was craving it so badly) and when it was spongy I was disappointed. The crust of the cake was also very dark and unpleasant. I think if I omit vanilla and try to use the oven on 330 it may come out denser and the crust lighter. What a fabulous cake. Rose beautifully, great texture. Just a tad too sweet for me so I’ll reduce the sugar a bit next time. Thanks for sharing. My mom was the pound cake lady at our church for many years. She passed away at a ripe old age and I have missed having a good pound cake since then. I decided that I would try some recipes and today cooked your PC recipe. I followed your instructions exactly. It did take app 1 hour 30 minutes in my oven. Oh my goodness is was outstanding! I will be using this recipe from now on. Thank you for sharing.